This scraper has a true straight edge for easy scraping and leveling. The "Freedom" thumb pad provides the application of direct pressure where needed. Welded stainless steel and solid handle for good balance. Approximate length 7" with 6" cutting edge width. Made of high carbonsteel wire and a hardwood hand, this tool is ideal for texturing encaustic paints. The skewed angle allows the artist to apply sweeping and pinpoint precise textures. 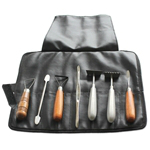 Made of high carbon steel wire and a hardwood hand, this tool is ideal for texturing encaustic paints. The rounded angle gives the tool its name "bullnose." Double End Chrome tool enables the artist to "pool" encaustic paint in either of the two spoon-like ends. Straight Stainless Steel Encaustic Scrapers are ideal for gently scraping layers of encaustic paint to achieve a smooth, glasslike surface. 6 1/4" length with approximate 1 1/4" cutting edge width. Stainless steel scraper creates deep texturing cuts in paint. 6 1/4" length with approximate 2 1/2" cutting edge width. Double End stainless steel texturing tool has fine and medium teeth at either end for detail design work. Stainless steel flexible spatula hand tools are st in wooden handles for comfortable gripping.This tool is slightly wider thanEN68T. Approximate length is 6 1/2"
This set includeds primary scrapers and texturing tools as well burnishers and tools for more advanced techniques: Skew Texturing Tool, D/E Texturing Tool, Loop Scraper, Chrome Burnisher, Medium Straight Scraper, 7 Tooth Scraper and Medium Spatula. Handmade, high carbon steel loop on well-balanced wood handle, offers a good grip. The double-sided edges are ground sharp for scraping. Approximately Length is 5 1/2" with a 1 1/2" cutting edge width. Starter Set includes basic scrapers and texturing tools to assist the artist in building layers and texturizing surfaces. 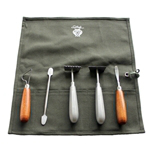 This set includes: Bullnose Text Tool, D/E Texturing Tool, 7 Tooth Scraper, Medium Straight Scraper and 1 Medium Spatula.